Today is #GivingTuesday, a global day of giving. At Seeding Labs, we are celebrating “Gratitude Tuesday” instead! We are filled with joy and gratitude for your generosity and support. As Instrumental Access equipment arrives around the world, your impact is felt from Mexico and Colombia to Ghana and beyond. 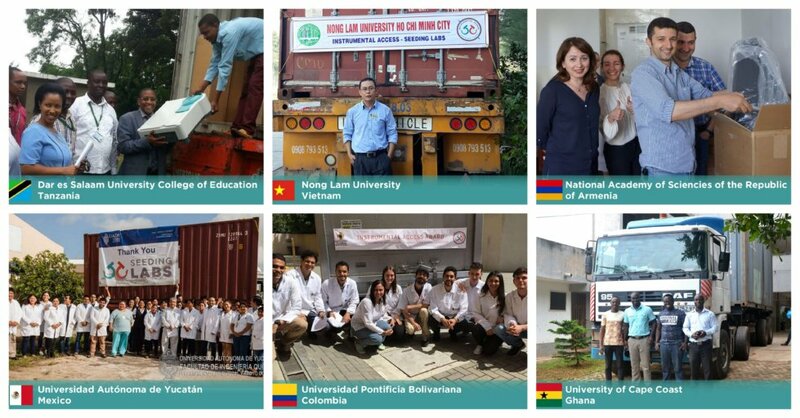 Above, you can see six of the 17 shipments that arrived at universities in 2018, all thanks to you! Chemical Engineering at the Universidad Autónoma de Yucatán (UADY) in Mexico: The equipment you helped send to the Department of Chemical Engineering at UADY is benefiting 1,200+ students as well as the research of nearly 60 faculty. One of the department’s projects is dedicated to studying how stem cells from dental pulp might be used as cell therapy to treat diseases like diabetes. Nanotechnology at the Universidad Pontificia Bolivariana (UPB) in Colombia: The Department of Nanotechnology Engineering at UPB is the first program of its kind in all of South America. The equipment they received, thanks to your support, is being used to establish a lab for energy storage research. The students were so excited the equipment had arrived that they came back early from break to unpack everything! Forensics at the University of Cape Coast (UCC) in Ghana: In West Africa, you’ve helped another "first and only" take root with the newly-established Department of Forensic Sciences at UCC. Their equipment is helping students get hands-on experience with the science-related aspects of criminal investigation. On behalf of the Seeding Labs team, thank you for making all of this possible with your incredible support! Y’all make the world a better place. Thanks and congratulations! Thanks so much for your support, Joan!